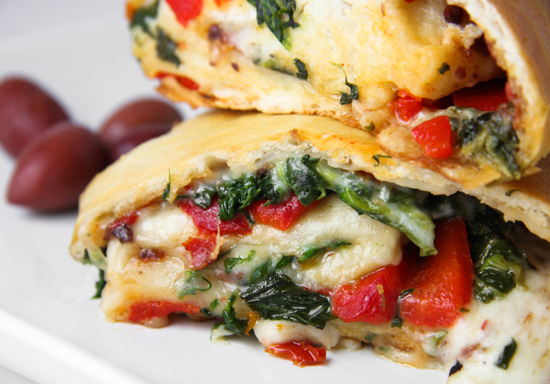 Veggie Cheese Stromboli Recipe — Pip and Ebby - easy, delicious recipes! One of my Top Five favorite recipes of all time! 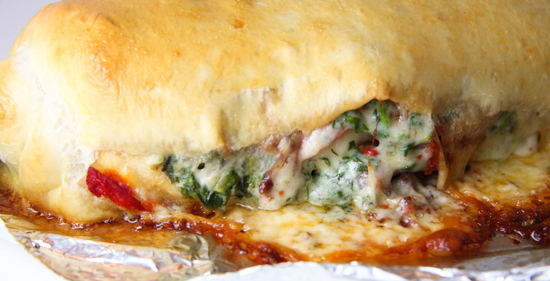 This Veggie Cheese Stromboli is SO GOOD. 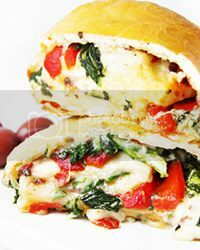 Inside the rolled up goodness of your baked Stromboli are spinach, roasted red peppers and sun-dried tomatoes. Melted with gooey cheese, your guests at a party will rave and it's also a great family dinner option! The first time I ate stromboli was a few years ago at 3:00 in the morning after a night out in Fort Myers, Florida. And oooohh my, did it taste delicious! Our friend's mother had made it for us, knowing we would likely be hungry when we got back to her house. My husband and I often reminisce about that late-night meal and immediately we are both salivating as badly as our 6-month-old drool machine, Sammy. Over the years, we have talked about attempting a stromboli recipe ourselves, but we just never did it. Until now! I didn't want to make just any old stromboli recipe. I wanted to make one that looked and sounded really good. 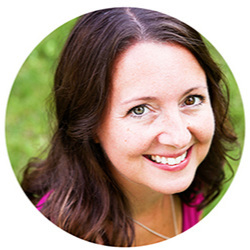 I kept my eyes open for a while and eventually I came across this recipe from Parenting magazine. It is incredible! We had a friend over at our house when it came out of the oven and the three of us stood at the kitchen counter and devoured almost the entire thing as if we were cows at the trough. Watch this easy tutorial to learn how to make your own NO YEAST pizza dough for this recipe! You have to make this! Yes, I'm giving orders. I don't want anyone to miss out. Preheat your oven to 400 degrees F and line a baking sheet with aluminum foil. Coat the foil generously with cooking spray. Combine in your food processor's bowl: 1/2 cup pitted kalamata or black olives, 8-10 sun-dried tomato halves, packed in oil, and 1 Tbsp. oil from the sun-dried tomato jar. Pulse until the mixture forms a rough paste. Lightly flour a flat working surface and a rolling pin. Roll 1 pound of pizza dough into a 14x10-inch rectangle. Spread the olive-tomato mixture onto the dough, leaving a 1-inch border around the edges. Top with 12-15 slices of overlapping provolone cheese. Top this with a 10-oz. box of frozen spinach that has been thawed and squeezed (to drain water) and a 12-oz. jar of roasted red peppers that have been drained, patted dry and cut into strips. Make sure the pepper strips run parallel to the longest side of the rectangle. Fold 1 inch of dough over the filling on the short sides of the rectangle. Then fold the long sides over and pinch the dough together at the corners. Roll the dough, starting at one of the long ends, as tightly as possible. Brush the border lightly with a bit of beaten egg and pinch the seam to seal it shut. Transfer the roll to your prepared baking sheet, seam side down. Brush the entire surface with beaten egg. Bake for 30 minutes in the preheated oven, or until the bread is golden and sounds hollow when it is tapped. Finally, if a bit of the guts have spilled out, take photos of it so you can show people how delicious it looks!! Here’s a close-up of the deliciousness. Time to make your own! Allow it to cool for a bit and cut into 1-inch strips crosswise. Have you started making it yet? Mix and match any of the ingredients in this recipe as well as mushrooms, onions, dill pickles, different flavors of cheese. If you LOVE Stromboli, please check out my other recipes! Preheat oven to 400 degrees F. Line a baking sheet with aluminum foil and coat with cooking spray. Combine the olives, sun-dried tomatoes and oil in a food processor and pulse until the mixture forms a rough paste. Lightly flour a work surface and rolling pin; roll dough into a 14x10-inch rectangle. Spread with olive mixture, leaving a 1-inch border around the dough edges on all sides. Top mixture with overlapping slices of cheese; add the spinach in an even layer. 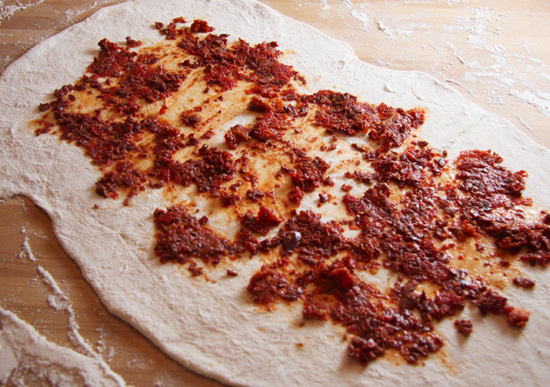 Finally, add the red pepper strips in a single layer, long sides parallel to the long sides of the dough rectangle. Fold 1 inch of dough over the filling on the short sides of the rectangle. Fold the long ends over the filling, pinching the dough together at the corners. Roll the dough, starting at one of the long ends, as tightly as possible. Before roll is done, brush the border lightly with egg and pinch the seam to seal. Transfer the roll, seam side down, to the prepared baking sheet and brush with the egg. Bake 30 minutes, until the bread is golden and sounds hollow when tapped. 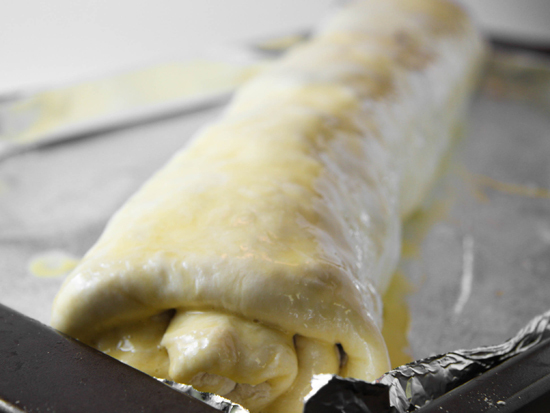 Loosen the bottom of stromboli from the foil with a spatula; transfer to a cutting board and let cool.